The card base is an A5 piece of Island Indigo cardstock folded in half. On top of that I've layered Mint Macaron and a piece of Tip Top Taupe that I embossed with the Elegant Dots embossing folder and added a piece of the Island Indigo cotton ribbon (retiring). 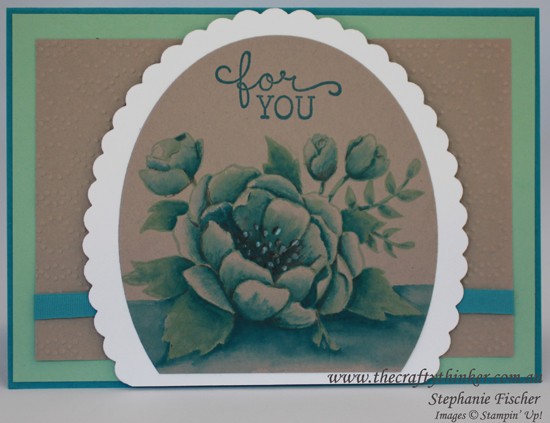 I stamped the Birthday Blooms image in Mint Macaron ink onto Tip Top Taupe cardstock and watercoloured it, using my usual method, with Mint Macaron, and Island Indigo ink. At the very end I added a little Tip Top Taupe with the fine end of a Stampin' Write Marker just to add a bit more depth in places. I stamped the greeting in Island Indigo ink and cut out the panel with the largest, non-scalloped, Ovals Collection framelit (retiring) and then trimmed off the bottom. I layered the painted panel onto the Whisper White scalloped oval and trimmed the bottom off that too. Then I stuck that panel to the card front using dimensionals.